We’d love your help. Let us know what’s wrong with this preview of Do Babies Matter? by Mary Ann Mason. 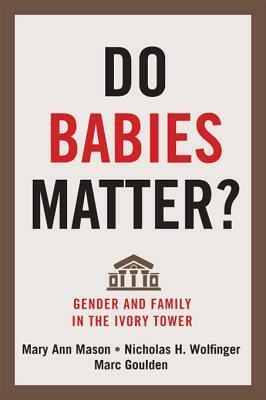 To ask other readers questions about Do Babies Matter?, please sign up. Be the first to ask a question about Do Babies Matter? Thought-provoking, but makes a lot of causal claims when the data don't warrant them. Still, this book takes on a daunting task - showing the effect of families on various stages of females' academic careers. Probably the most depressing book I have ever written if you work in an university. Although it has made me feel better about my career!!! Any female undergrad student thinking of going into academia should not probably read this. Thoroughly depressing but much needed book about the problems of meshing academia and motherhood in our present society. Depressing but some good suggestions. Not sure they're very actionable for all institutions.